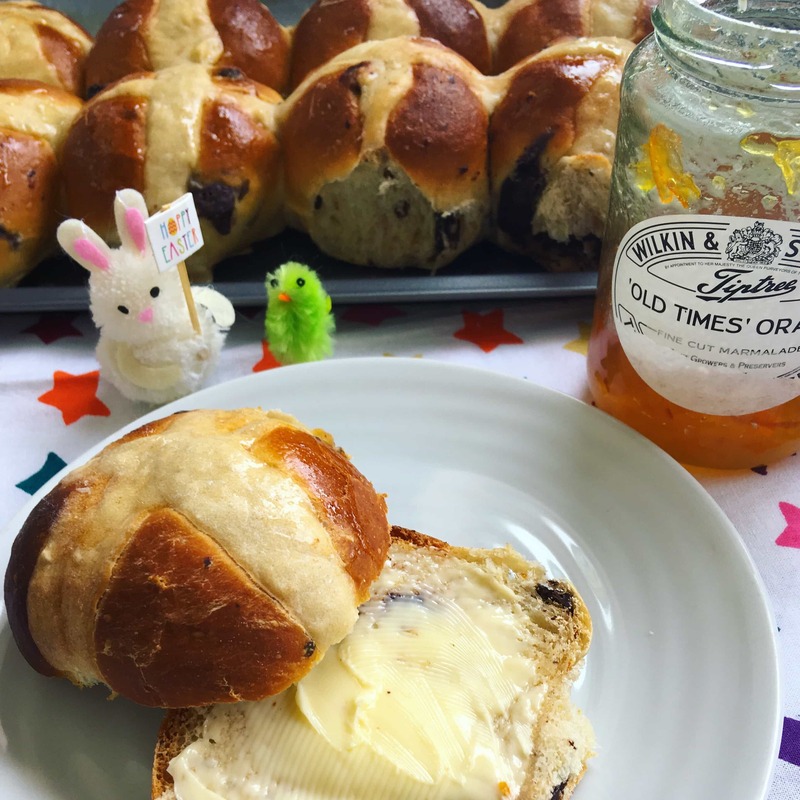 chocolate orange hot cross buns – soft, sweet buns with dark chocolate chunks and zesty orange! It must be true what they say about your taste in food changing as you get older. When I was little I couldn’t get enough of chocolate. Easter was an extremely exciting time for me – the one day of the year where you were allowed to eat as much chocolate as you wanted and no-one would tell you off was my idea of heaven. 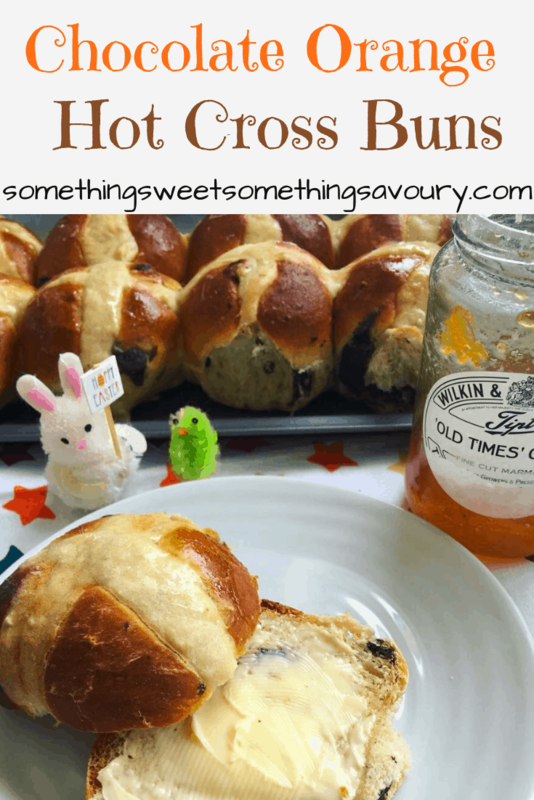 But now you can keep your Easter eggs – the best thing about Easter for me is hot cross buns. Fluffy, soft, spicy buns spread with butter while they are still warm from the oven – yes please! I wanted to try a chocolate orange version ever since I tried some from a local bakeryand loved them. I was a little disappointed this year when I learned they were no longer making them but it gave me the push I needed to make my own. They are very good toasted under a hot grill and spread with butter and marmalade. 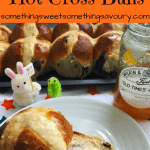 How do you make chocolate orange hot cross buns? 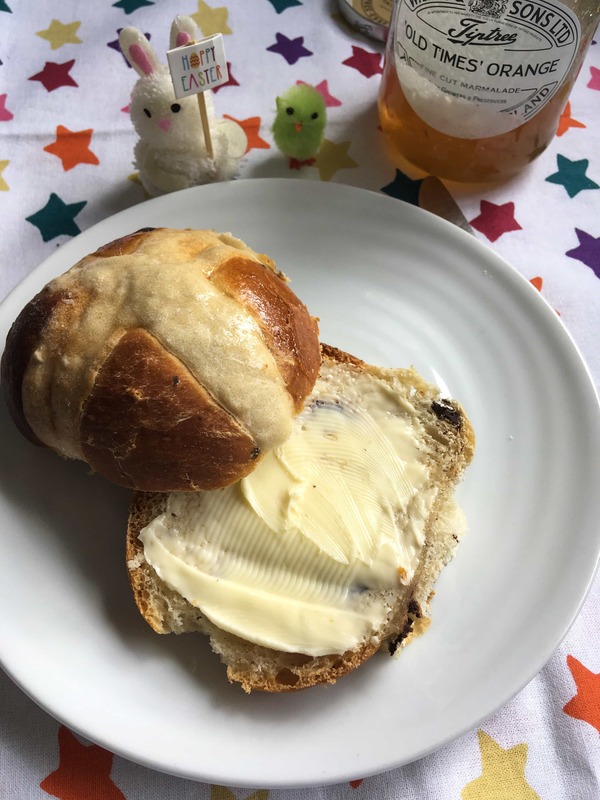 I followed the basic recipe for these orange, cranberry and white chocolate hot cross buns I made last Easter and added the zest of one large orange, 1/2 tsp Orange extract and 80g dark chocolate chips. When they came out of the oven I brushed them with a glaze I made by boiling 3 tbsp honey, 1 tbsp water and 1/2 tsp cinnamon together in a small pan until syrupy. Place the flour in a large mixing bowl. Add the salt, sugar and yeast to the bowl, keeping the salt and yeast separate. Add the warm milk, soft butter, eggs, orange extract and half the water. Mix the ingredients together until you have a soft dough. If it is too dry, add the remaining water slowly until you have a soft, but not soggy, dough. Knead for 5 mins in a mixer or 10 minutes by hand or until the dough is very smooth and bouncy. Place the dough in a lightly oiled bowl, cover and leave to prove in a warmish place for at least 1-2 hours or until the dough is doubled in size. Once the dough is ready, turn out onto a lightly floured work surface. Lightly flatten it out a little and place the orange zest and chocolate chunks on top. Gently work them into the dough until they are all evenly incorporated. Place the dough back into the bowl and leave for one hour until risen in size again. Divide the dough into twelve equal portions - if you want them all the same size you can weigh them - 75g is a good size. Roll each piece of dough into balls and place fairly close together on a baking tray lined with baking paper. Cover and leave to prove for 45-60 minutes until well risen and at least doubled in size. About 30 minutes before proving time is done, preheat the oven to 200C. For the crosses, mix 75g plain flour and 75-100ml water together until you have a smooth paste that isn't too runny. Using a piping bag fitted with a small nozzle, pipe crosses on the buns. Alternatively, you can drizzle the crosses over using a teaspoon. Bake for 20-25 minutes or until the buns are golden brown. Remove the buns from the oven and brush the glaze over the buns immediately. Transfer to a wire rack. In a small pan, boil the honey, water and sugar together until syrupy and slightly thickened. Remove from the heat. These sound delicious especially with a cinnamon honey glaze. They look perfect too!